I have not been impressed with the story time at our local library. 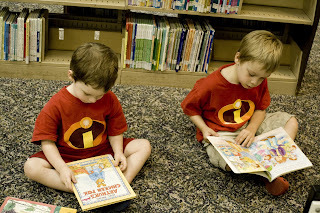 I recently learned that the folks reading to the kids are not children's librarians. Well, why not? Intrigued I asked a librarian and she informed me that there are only a select few children's librarians in the county, and that these people are placed in branches based on need. The way the library determines this is by looking at the number of books checked out in the department. After chatting with some SAHm/d's in the area not many of us are checking out the maximum 75 book limit because we all live within walking distance and read the books there at the library. Well now all that's changed in our house. We checked out 32 books today and came home and had story time. My kids sat for 45 minutes listening to story after story. (this is pretty impressive for a 3 and 5 year old) Check at your local library to see if you have a children's librarian and if not..start checking out more books. ps- I normally do not dress my kids in matching outfits. They actually dress themselves and both boys wanted to wear matching shirts. I'm thinking that you and I are in the same town-- as this has been a conversation lately on our playgroup's listserv. We are totally with you on the storytime... here's hoping it will get better! You better watch out they just might ask you to volunteer reading to children at the library. You could start your own group and have story time at the Library.